My grandma used to have a Guyabano tree. I don't remember where in the yard in particular. There must have been more than a tree because I remember not giving attention to Guyabano servings at home because they were in abundance. I honestly disliked the taste and texture of the fruit's pulp as a kid. I remember though that as a juice drink in a tetra pack I totally loved it! Dad used to buy them. I forgot about Guyabano until several months ago when I became more conscious about my health and read so many great things about it. Apparently research has proven Guyabano to be effective in selectively killing cancer cells aside from it boosting the immune system. Banana on the other hand has been a long time favorite of mine. I have been told by the folks that it is the most effective fruit to eat to get rid of pimples because monkeys love bananas and see, they do not have pimples! Kidding aside what is there not to love about a banana? Its color imbibes the radiant sunshine and have that soft, naturally chewy feel on the palate. It is rich in potassium and other minerals needed to replenish the body. Come join me enjoy our yard grown guyabano and banana! I've never heard of a guyabano, we don't have them here in the states I guess. I do love bananas though. My hubby won't eat them staight out but I love them. I never really liked Guyabano as a kid too maybe because of its look and I also do not find it appealing to eat. On the other hand, my all time favorite fruit the world is banana particularly the Lakatan. I loved fruits, and Guyabano too! I used to ate the whole fruit with gusto. Guyabano juice has lots of Vitamin C too. I do love both of those fruits, i am glad to learn the benefits you can get by just eating them and enjoying the good taste of it. I remember Guyabano is just around my grandmother's property and I don't need to buy in the maket.I miss those good old days. I miss guyabano, nakakadrool tuloy hahaha. My grandparents used to have a a lot of guyabano arund their homes but when they died, those guyabno trees died too. Thanks for the memories Doc Ganda. Banana and guyabano - can I say smoothie? No sugar needed hahaha. Now, I'm salivating. 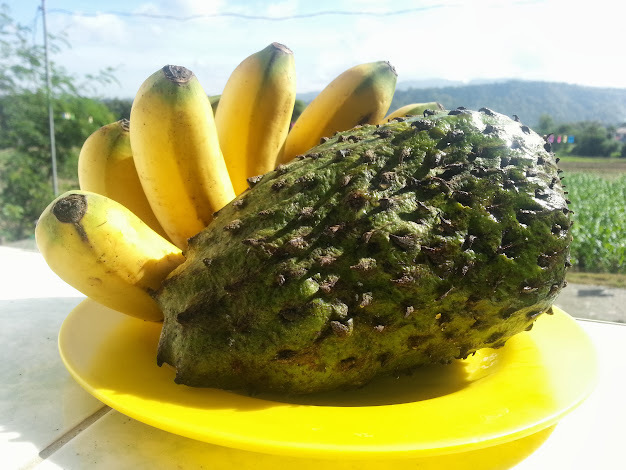 They call it soursop here in my neck of the woods, but sadly, it's rarely available in the form of fruit. I'm lucky if I see it in tea. Bananas are staple in my kitchen both fresh and frozen which I use for my smoothies every single day. I've read somewhere about guyabano being a miracle fruit. As for banana, love it! how I miss that kind of banana. We used to have guyabano trees back in the day. I just miss the sourness and sweetness flavor of that fruit. Wish we have that here in the US. I love guyabano! I used to feast over this fruit on our yard when I was a kid. However, my mom decided to cut the tree. No more Guyabanos to eat when I come home anymore and I very seldom cross paths with this precious fruit these days. Sigh! You're lucky! When my Aunt died of cervical cancer almost two years ago, only then had I learned of the benefits of eating guyabato, It's found to be anti-cancer. I am not sure if I could get it from here but banana has always been my daily staple.